Calling all Designers! What's that you say, you're not a designer?! If you can make merchandise for Etsy, the local flea market, or just toy with DIY projects for friends you really should expand your definition of a designer. 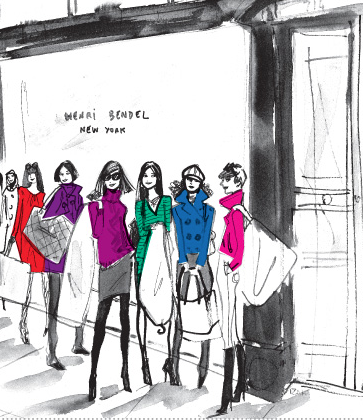 NYC department store Henri Bendel will host its Open-See on Friday March 23, 2012. The Open-See is the general public's invitation to present unique designs to a panel of its buyers. If the buyers like your stuff, they place an order on the spot. And just like that, your creations could be on the shelves of a prominent NYC department store. Henri Bendel's Open-See launched the careers of many well know designers including Anna Sui and Todd Oldham. Just remember- I'm taking a cut when the big bucks start rolling in! Since the Open-See is such a rare opportunity, expect a ton of people to line up with a bevy of impressive stuff. That means get there early (to be seen you must be in line before 12pm), dress to stand out, and bring only your best pieces! Read more about the Open-See in this archived NY Times article. You have 3 weeks. Ready, set... Get to craftin'. What Can You Make? Leave your comments below. This sounds amazing! Are you going? Will you go?These sounds amazing!! !